An intense week of visiting sites of remembrance in NYC. 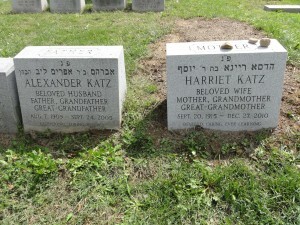 My parents, Amy and the girls and I went down there primarily for the unveiling of my Grandma Harriet Katz’s headstone. She passed away last December at age 95. 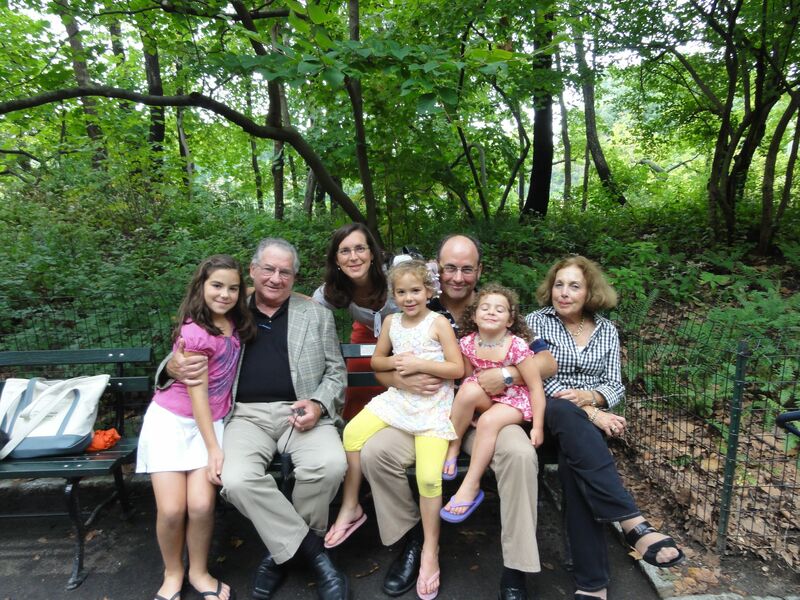 While we were there, we went to Central Park to see the bench that has the memorial plaque we created for my brother Aaron. [You can see my earlier post about this bench, including a map of how to get there, the New York Daily News article about Aaron and the bench, as well as my May 2011 essay in The Awl about Aaron and how we remember him.] My parents had visited earlier but this was the first time for me, Amy and the girls. 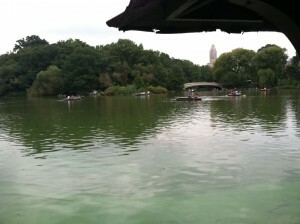 What’s inescapable visiting the bench, which is right next to a rustic pergola along the walkway between the west side road and a little gazebo overlooking The Lake, is the unstoppable life of the city and nature that is present in the park. Many New Yorkers and visitors were out running and walking, listening to music (for whatever reason, bongo players seem always to be present near this spot when we visit), and, now, reading the plaques on the benches–which themselves range from marriage proposals to memorials. We spent some time sitting on the bench, then walked to the gazebo nearby and watched some turtles make swirling black trails as they swam through the St. Patrick’s Day-green algae that covered the lake. A fitting moment as we honored a man who had among his happiest moments those spent with Animal Planet. We then Sunday went out to the beautiful, sprawling Mt. 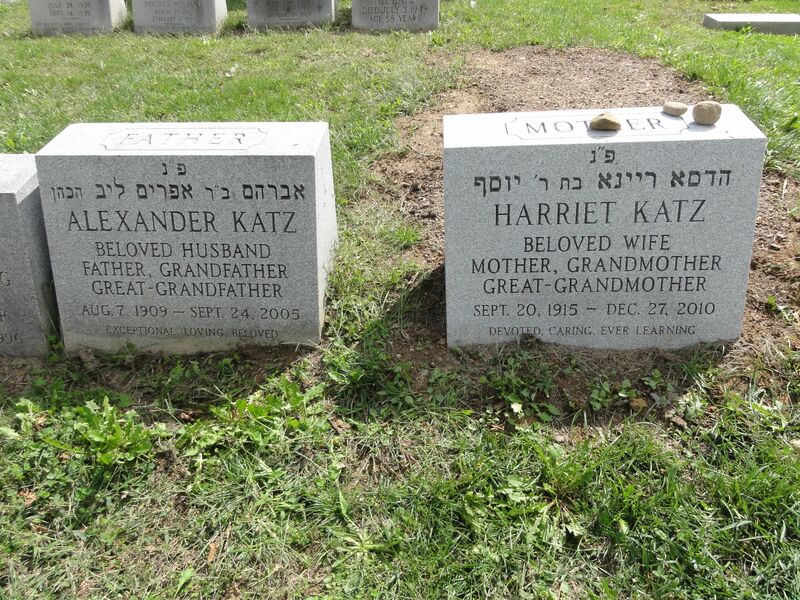 Hebron Cemeteryin Queens to dedicate the headstone of my grandmother, Harriet Katz. A native of Manhattan, she spent most of her adult life in Phoenix, then came to the Boston area to live near my parents after my Grandpa Al died in 2005. 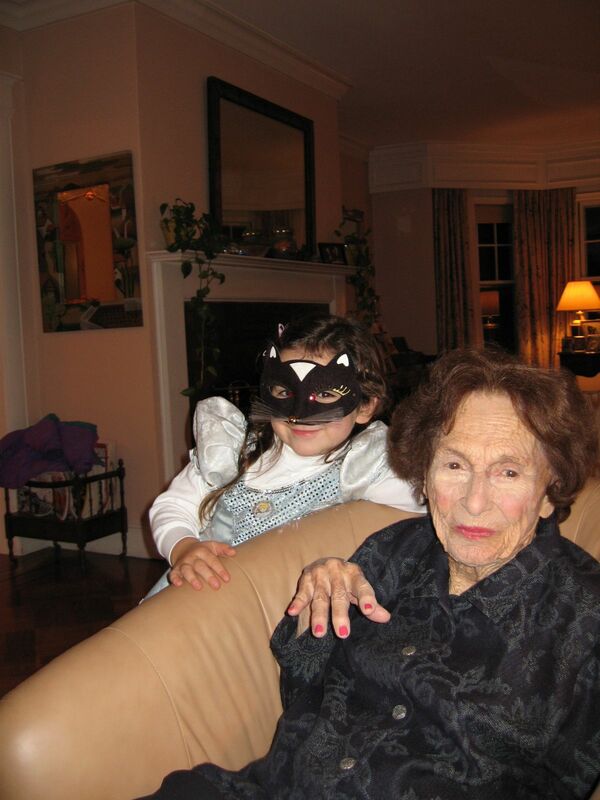 We were so fortunate that during her years in Boston we and our girls got to spend time with “Grandma Harriet.” When we asked the girls to remember things about her, they talked about going over to her apartment and doing dances and singing for her as she sat in her chair. A bit before then, while my Grandma was still more active, she was often present for important and mundane moments, such as when she and three-year-old A. (in her cat costume for Halloween) shared a feline look in this shot from five years ago. Having these years of knowing their great-grandma as a regular part of their lives helped the girls be wonderfully supportive of us, especially my mom, as we did the short memorial service and took a ceremonial cover off the gravestone. I was so grateful to them for their sweet and heartfelt hugs and remembrances of Grandma.